scribiu.git - Read notebooks and voice memos from Livescribe pens. 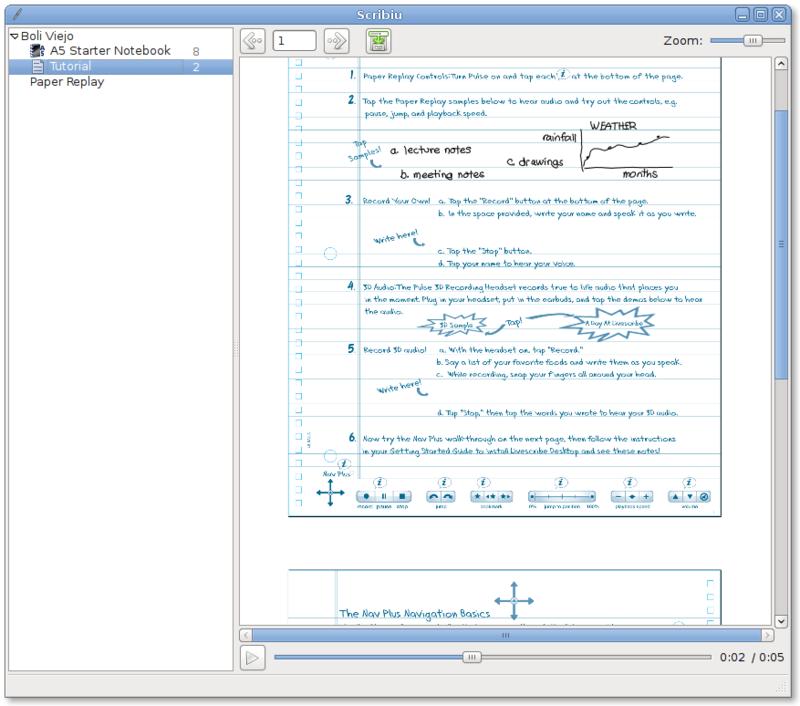 Scribiu is a program that shows the notebooks and voice notes (paper replay) from Livescribe Echo smartpens. It also allows you to export individual pages as PNG files or voice memos as AAC files. Scribiu requires Qt 4.8, including the core, gui, svg and phonon modules. It also requires libudev, openobex, libusb (<1.0) and QuaZip. Most of these should be packaged by your distribution. This program should work with the Livescribe Pulse as well as the Livescribe Echo. It does not work with the Livescribe 3. It may work with the Livescribe Sky if you get it to work with Echo Desktop, but I have never tried. qmake, make, and make install should be enough. A udev rule will be installed in /etc/udev/60-livescribe.rules that will take care of the proper permissions when a Smartpen is detected. You may need to reboot or reload the udev daemon in order for these changes to work. Look for the Scribiu icon inside the Office menu. It should automatically start synchronizing after connecting a Smartpen. By default Scribiu stores its information inside $XDG_DATA_HOME/data/scribiu. Inside there you will find a directory for every synchronized pen, and inside the pen directory, you will find a subdirectory for each one of your LiveScribe notebooks. These directories contain the raw notebook, stroke, and voice data as received from the pen -- no processing is done. Therefore, even if Scribiu fails to display a certain notebook, you may be able to use other Livescribe programs in order to view the synchronized data. We thank the authors of libsmartpen and LibreScribe because of their protocol reverse engineering efforts, specially regarding the STF data format, which has saved me a lot of time. Notebook archiving support: it should just be a matter of cp-ing the .afd file into a new .pen directory. However, need to take care of paper replay and possibly generate a new GUID for the archived notebook. Export entire notebook as PDF. Deleting stuff from the pen: for now it's best to do this from LS Desktop.